Only 38 days to go. To the continuing amazement of those who clung to the forlorn hope that calm heads and political professionals would come together for the sake of the common good and thrash out some sort of agreement, we are now further away from any sort of rational compromise on Brexit than ever before. At this stage, bemused commentators have simply run out of adjectives to describe the chaos in Westminster, where it now seems as if those infamously gabby London cabbies would be able to make a better fist of it. Shambolic? Crazy? Self-defeating? Downright weird? All those and more spring to mind when it comes to the amateur-hour nonsense that has been peddled by Theresa May’s government in recent weeks. Now, as if taking the carnage in the Conservative Party as an inspiration rather than a warning, Labour has decided to add another word to the heady mix of superlatives – schismatic. 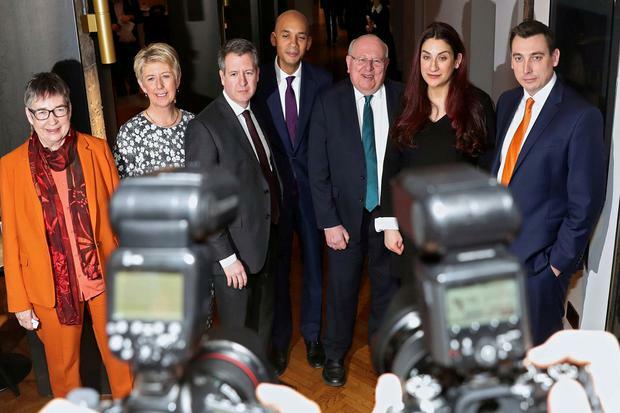 Yesterday’s decision by seven moderate Labour MPs to split away from Jeremy Corbyn’s current, Momentum-led incarnation of that once-proud party may be seen as a minor sliver of political relief for the beleaguered Tories. They can take a brief respite from stabbing their leader, and each other, in the back to bask in the warm glow of watching Labour MPs turn on themselves. In truth, this split would have happened with or without Brexit, and there is a strong argument that, without Brexit concentrating minds, it actually would have happened months ago. Labour has been riven with accusations of anti-Semitism and a drift to hardline and genuinely communist policies ever since Corbyn took the reins three years ago. Corbyn and his sidekick John McDonnell, along with the rest of the lunatic Momentum fringe, can’t believe their luck that they are in charge, and the treatment of some of their own MPs has been inexcusable. For a party which likes to boast of its anti-racist and progressive principles, the hostility towards its Jewish members comes from the top down. After all, when it emerged that Corbyn had claimed that “Zionists don’t understand English irony”, former chief rabbi Jonathan Sacks was moved to say last year that the remarks were the “most offensive statement by a senior British politician since Enoch Powell’s 1968 ‘rivers of blood’ speech”. But while that is an interesting story of itself, Irish eyes will be more concerned with the fact that Corbyn and his fellow travellers thrive on chaos and discord and, therefore, a no-deal Brexit would suit their long-term purposes quite well. As we hurtle into the last month before the appalling spectre of a no-deal Brexit becomes a reality, last week’s convenient leak to Reuters by an unnamed EU official that the Irish would have to choose between a hard Border with the North or some sort of regulatory border with the EU was both terrifying and yet unsurprising. The hope, in the short-term at least, was that an interim backstop could be introduced which would alleviate some of the immediate pressure. But it’s now clear that the backstop is a dead end and despite public claims to the contrary, we’re faced with the grim prospect of deciding where we want to erect a border – up the road with our friends in the North or across the sea with our overlords in the EU. Thursday’s unattributed comments about the reality of some form of border may not be music to our ears. But from an EU perspective, it simply doesn’t have any choice. After all, any large, porous hole in the EU’s borders, such as would be left in the event of keeping things as they were in the North, would simply undermine the integrity of the customs union. That might not mean much to us, but it’s a central plank of EU unity and we should never forget that as the European leaders try to cope with this situation, they’re also casting worried glances at other mutinous territories, such as the former Eastern Bloc countries, as well as Greece and Italy. They simply have to play hard ball. Nor should we try to convince ourselves that those comments were a solo run by a rogue EU diplomat. You don’t need a masters degree in pure economics to know that either option would be a financial calamity for this country. It’s also a reminder that because of the hubris and sheer bloody minded stupidity of a rump of Tory MPs we could, almost before we know it, find ourselves effectively exiled from the customs union – which is, after all, the main reason why we’re members of the European Union in the first place. Never in the history of this State have we found ourselves caught between such a rock and a hard place. If, as has been strongly hinted in recent days, we have to re-establish a Border with the North, we can expect mayhem. Unesco’s report yesterday laid out this unlovely scenario in unequivocal terms. According to the report, a return to a hard Border would be gladly exploited by the men of violence who, as we all know, haven’t gone away. According to the authors, it’s not a question of whether there will be violence, but how bad that violence will be. They also pour cold water on the Sinn Féin idea of a Border poll or any imprudent rush to hold a referendum on a united Ireland for the same reasons. Any of these actions, according to this alarming document, will simply result in chaos. The conclusions may be depressing but, again, they’re hardly surprising, and when you consider the recent muscle-flexing of groups like the so-called ‘New IRA’, it’s hard to escape the impression that dissident Republicans have done a better job of planning ahead for a no-deal Brexit than any of the democratically elected politicians. If there was a panic button, all sides would surely be pressing it by now, and the fact that, even at this late stage, nobody has been able to pull a rabbit out of the hat is an indication that this is simply an intractable problem with no solution. One ray of hope from our perspective is that Brexiteers are worried that May will try to, as they put it, ‘kick the can down the road’. Even that seems unlikely now, and we’re left with the infuriating reality that the most disastrous referendum in our nation’s history was held in another country.